Patel Conservatory: From the Blog: Enter to win three nights in New York City! Imagine yourself on the bustling streets of the Big Apple, heading to see a Broadway show! Enter our 2014 Spotlights Awards drawing, and you could be the lucky winner of a three-night stay at the exclusive Hilton Club in New York City! This year’s drawing for the 2014 Spotlight Awards features three fantastic prizes. All proceeds from the drawing support the classes, scholarships and outreach programs of the Patel Conservatory at the Straz Center. The Patel Conservatory awards more than $250,000 in scholarships and financial aid each year. You can help by entering our drawing. If every Conservatory student purchases just one ticket, the drawing will raise more than $10,000. Help us reach our goal by purchasing your tickets today! Grand Prize will be a three-night stay in a two-bedroom suite at the exclusive Hilton Club AND four orchestra tickets to a Broadway show, generously donated by Florida Health Care News/Dr. Barry Levine and Gina d’Angelo. 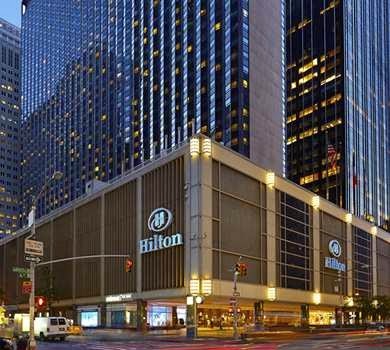 The Hilton Club is just a block from the Museum of Modern Art, a few blocks south of Central Park, and a 10-minute walk to Times Square and the Theater District. Second Prize will be a Westinghouse 46” Flat screen HDTV, valued at $1,000, donated by Florida Health Care News/Dr. Barry Levine and Gina d’Angelo. Third Prize will be a 16GB Apple iPad Air, valued at $499, Donated by Drs. Kiran C. and Pallavi K. Patel. The drawing will take place at the Spotlight Awards, which will be Tues., May 20, 2014. The suggested donation is $10 per entry. Get your tickets before May 15, and score three entries for $20. From May 15 through May 20, 2014, entries will be three for $25. All students are encouraged to support their Conservatory by selling drawing tickets to family and friends. This is an easy way to show your support! Stop by our registrar’s office in the Chairmen’s library for your tickets today! *New York Experience must be completed no later than Sept. 1, 2015. Prize includes three consecutive nights in a privately-owned two-bedroom suite at the Hilton Club New York, and four orchestra level seats to a Broadway show selected by the donor and the winner. Dates of the stay and show are subject to availability. Winner must provide a minimum of 120 days notice for booking the stay. Blackout dates for Hilton Club are Nov. 21, 2014 through Jan. 4, 2015, and Mar. 29, 2015 through April 5, 2015. Airfare not included. THE DAVID A. STRAZ, JR. CENTER FOR THE PERFORMING ARTS IS A 501(C)(3) NOT-FOR-PROFIT ORGANIZATION AND ALL GIFTS MADE TO THE STRAZ CENTER ARE TAX-DEDUCTIBLE TO THE EXTENT PROVIDED BY LAW. 100% OF CONTRIBUTIONS RECEIVED ARE RETAINED BY THIS ORGANIZATION. A COPY OF THE OFFICIAL REGISTRATION AND FINANCIAL INFORMATION MAY BE OBTAINED FROM THE DIVISION OF CONSUMER SERVICES BY CALLING TOLL-FREE 1-800-435-7352 WITHIN THE STATE. REGISTRATION DOES NOT IMPLY ENDORSEMENT, APPROVAL, OR RECOMMENDATION BY THE STATE. REGISTRATION NUMBER SC-02449.